According to ayurvedic philosophy, our dietary needs change with the seasons. I am ready for Spring and Summer, and the Energy Muesli is perfect for getting ready for the sunny season. Another one of Zen's signature recipes! Gently roasted oats combined with an array of tasty bits and pieces. 100% natural ingredients, and no added sugar at all. To serve, just add fresh fruit, and your choice of dairy - yoghurt, milk, soy milk or almond milk, and your breakfast is ready to go. 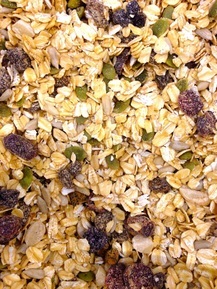 Ingredients (varies with season and availability): oats, nuts, seeds, dried fruit, coconut, crushed flax seed, goji berries.